I’ve never seen something before nor did I know it can be achieved with CSS… Impressive! Why the hell would something ever be supported in only safari? L2Firefox bro. At the time only Safari 5 is capable to render it, neither Firefox nor Chrome do support translateZ which is necessary to create 3D effects with CSS. This doesn’t mean, Safari (Webkit) is superior by any means, but both engines support different upcoming “standards”. Check this http://cordobo.com/1630-internet-explorer-pure-css-logo/ in Firefox & Safari/Chrome and you’ll see FF has better results. Works in the Sunrise browser! thanks, I’m glad you like them. I’ll be keeping an eye out for your “CSS 4D Framework” Sounds REALLY interesting! the only question is – why? 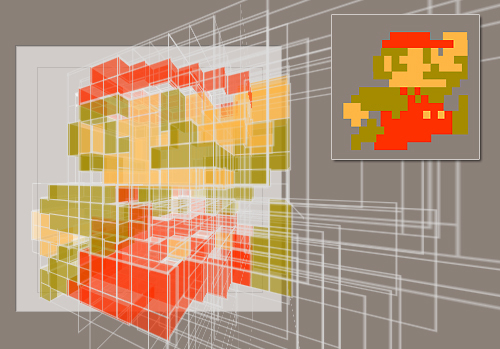 creating the 3D Super Mario Icon was a good CSS3 practice for me. I’m more impressed by your IE logo but this is some incredible work, probably took a lot of time and aspirin.